The BBC Trust has announced it is to suspend the online education service, BBC Jam, pending a review. It follows complaints from commercial online companies to the European Commission about the £150m project. They say the service, designed as a learning resource for children aged five to 16 in support of the national curriculums, damages their businesses. Acting BBC Trust chairman Chitra Bharucha said the trust regretted the need to suspend the service. She apologised to users of BBC Jam and to the corporation's staff and suppliers affected by the decision. 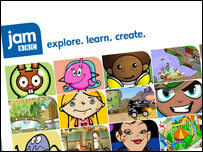 BBC Jam is an online learning resource for children, designed to be used at home to support key areas of the school curriculums across the UK. It will be suspended from 20 March 2007. The service went live in January 2006, with the BBC pledging to invest £150m over five years. Half of the budget has already been spent. The corporation planned to keep adding new material with the aim of completing the site by September next year. The service was approved by the government in January 2003. It was freely available to anyone in the UK with an internet connection. It has 170,000 registered users but you can use the site without registering so there is no accurate picture of how many people are using the resource. Acting BBC Trust Chairman Chitra Bharucha said in a statement: "The Trust has requested BBC management to prepare fresh proposals for how the BBC should deliver the Charter obligation to promote formal education and learning, meeting the online needs to school age children. "Despite a rigorous approval process involving the BBC Governors, the Department for Culture Media and Sport, and the European Commission resulting in extensive conditions on the service, BBC Jam has continued to attract complaints from the commercial sector about the parameters of its activities." The case was taken to the European Commission by representatives of educational software companies, BESA, the British Educational Suppliers Association, who said the service was damaging their business. The group said they took the action after their complaints to a watchdog - that the service being devised by the BBC was not distinctive and complementary to existing provision - were not acted on by the government. Dominic Savage, the director general of BESA, said: "We welcome the fact that the BBC Trust has concluded that there is a case to answer about Jam: that it is not distinctive and complementary. "We conclude that because they are being asked to prepare fresh proposals to do what they need to do for schools." "Right from the initial consultation we were concerned that such a service would duplicate what the software industry does." Mr Savage said the new service should be shaped in such a way that it did not compete with the UK's successful educational software industry. The group wanted to be involved in the review of what service should be provided by the BBC, he said. "We hope that we will be asked to be part of the decision, so that we can help come up with a public service and find a new way forward," he said. Under the BBC's charter, the corporation is charged with promoting learning for school-aged children. One of the conditions BBC Jam was set up with was that half of its content budget had to be spent on commissioning material from outside the BBC. Conservative broadcasting spokesman Ed Vaizey said: "This is a mess of the government's own making. "They told the BBC to set up Jam even though a number of education companies were already providing those services. "We have constantly raised concerns about BBC Jam and its impact on the private sector. It does not surprise us that the service has been suspended. The blame rests fairly with the government." About 190 staff at the BBC work on the project and there are contracts with independent production companies. It is not yet clear what will happen to those involved.